So The Southern Indiana Writers Group decided to do a Middle Grade anthology. We each wrote a character sheet for a kid, all of whom attended Wurstburg Middle School. We made copies of our character’s sheet and swapped them around, then each wrote a story with some (or all) of the characters in it. 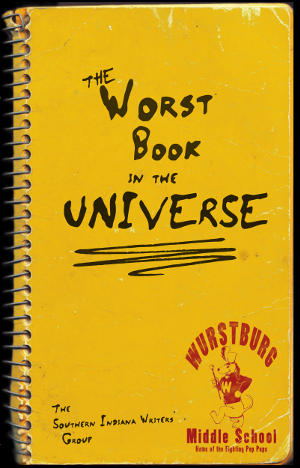 Each story contains the line, “the worst book in the universe.” And that’s the title of the anthology: THE WORST BOOK IN THE UNIVERSE. Here’s a bit from mine, “It Came From Burr County.” In it, my character, Haskell, has hidden a book in a train case in the attic. But his Aunt Ginger has come to stay a couple of days and to borrow some luggage. One piece is the train case, which is now in her room. Snake looked to Danny for his answer. Buy THE WORST BOOK IN THE UNIVERSE in print or Kindle editions through Amazon, or can be ordered through your friendly neighborhood independent bookseller. A WRITING PROMPT FOR YOU: What does your main character consider the worst book in the universe? This entry was posted in Sample Sunday, Writing. Tagged middle grade fiction, short story excerpt, the writing process. Amazing what you do with these prompts. I’m staring slack-jawed at the screen in amazement. Oh, I’m not working from these prompts. That’s why I say A WRITING PROMPT FOR YOU. I derive those prompts from what I’ve written. If I write from a prompt, I say MY WRITING PROMPT TODAY. 🙂 I enjoy writing from prompts, though.